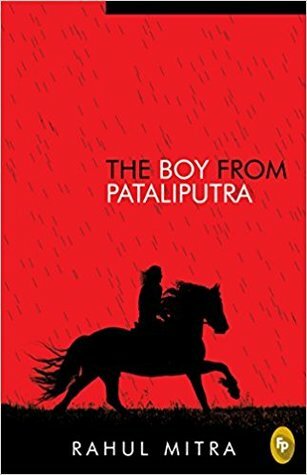 The Boy from Pataliputra is an historical novel by the Indian author, Rahul Mitra. It is staged against the Alexandrian era, in the years of 300 B.C. Aditya and Ajeet are brothers, with no family, living in Pataliputra, in the Magdha kingdom. Though the king is Hindu, majority of the mass practices Hinduism; but still Buddhist monks influence the kingdom because they are wealthy. Ajeet has been framed by the minister of justice, Indukalpa. And as a consequence, Ajeet is being executed publicly while his younger brother Aditya and other well-wishers watch as mute spectators. The administration is at the peak of corruption. Following the execution, Aditya attacks on Indukalpa but fails to nail him down. This action forces him to be fugitive. 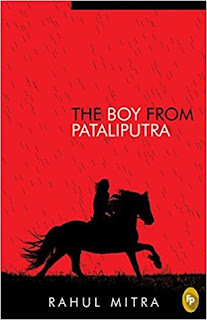 But why did Indukalpa order to execute Ajeet remains unclear but certainly it is the best climax in the book which forces the boy to flee from Pataliputra to strive ahead in life. With the help of some well-wishers he is packed and sent to Takshashila via a river route. Pandi, his guardian, is a stolid mercenary who teaches him sword fighting and other skills. In Takshashila, while being a student he struggles for sustenance and makes some good friends, like Rishaba and Tanku – the old man who runs a dhaba for students. At this point the novel changes the pace to become a student-oriented novel, most of the chores and the methods of social gathering and parties seem same to the modern times, however the only difference is time era, it is around 300 B.C. Sumukha is a well-spoilt young man, who abhors outsiders in his kingdom, Gandhara. One night he beats the hell out of Aditya and his friends. Being miserable and poor, their only chance to hand him a humiliating revenge is to defeat him in the horse racing. Aditya and his friends practice hard. Sumukha is the best when it comes to horse racing. He has been championing it for three years in a row. Aditya wins the risky race but fails to win Devika, a girl whom he likes, but she is always dicey for him and prefers to support Sumukha all the time. The horse racing makes him locally famous and Maharaja Ambhi, the king of Gandhara, being impressed by his galloping skills takes him as a soldier into the army. On the other side of the story, the great Alexandra with his mighty Greek army has taken over the powerful Persian kingdom and is rapidly advancing towards India. The writer has mentioned India several times. Well, then the concept of one long nation with a title of ‘India’ was non-existent. Then the lineage of kingdoms was particularly prevalent. When the refugees from neighboring provinces or states lurk around Gandhara for food and shelter, Maharaja Ambhi not only drives them out but also signs a truce with Alexandra. This diffident act infuriates many patriotic people as they are completely against the outside invasion, and they all take up rioting to protest and lament Maharaja Ambhi’s decision. Ambhi’s army kills many students and imprisons some of the prominent teachers of Takshashila University. Aditya being a soldier watches everything silently until he hears about attack on Pandi. Aditya joins the students and they form an army and run away to Kekeya, a nearby kingdom. The student army joins the army of Maharaja Porus and dole out a tough resistance to the Greek army. The army of Kekeya was about to tramp the Greeks, but just in time seeing the bloodshed all around, Maharaja Porus accepts the truce sent by Alexandra. The student movement feels betrayed by both the Indian kings, having nowhere to go, they all sneak into the darkness of forests, basically to survive and start life afresh. At this time, when most of the young writers from India are trying to be bestsellers by writing familiar love and college based stories, Rahul has originated a sweeping story from the Alexandrian era that can possibly put him on the lines of Bernard Cornwell, C.J. Sansom and Susanna Gregory. The way the writer has framed the students of Takshashila into an act of defiance is something which holds the momentum of the book, this act keeps the gusto alive and as a result the narration never sees a dip. Since the protagonist is back to the square one, chances of a sequel are healthy.